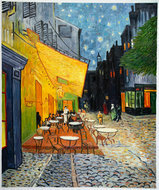 The Brothel is one of those oil paintings that Vincent Van Gogh created to depict the night life at Arles. 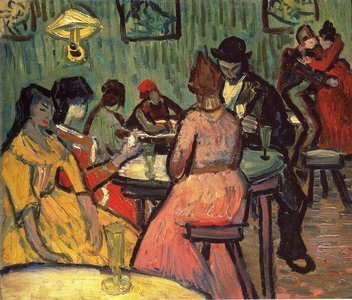 This was made during October 1888, when he was staying at Arles with his friend Gauguin. Our artists have studied Van Gogh's technique thoroughly to be able to paint the masterpieces that you can see on our website like The Brothel. 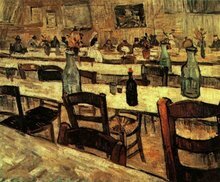 Van Gogh moved to Arles in February 1888 as he was suffering from his smoker’s cough. 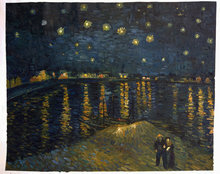 His objective was to find an art colony in Arles. 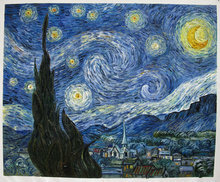 Initially, the place seemed exotic to Van Gogh. He wrote to this brother that everything of Arles, including the Brothels, the Zouaves and the people, seem like something that is from a totally different world to him. 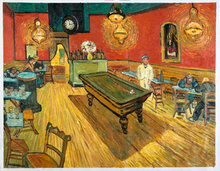 Van Gogh’s decision to furnish his Yellow House, which he not only wanted to live in but also use as a studio, made him create many paintings like Bedroom in Arles (1888),Van Gogh's Chair (1888), Starry Night Over the Rhone (1888),Vase with Twelve Sunflowers (1888),The Night Café (1888) and Cafe Terrace at Night (September 1888), so as to decorate his Yellow house. The Brothel must have been one painting he must have created around this time. Although Gauguin, who was staying with him during the period, did not approve of his visits to the low-life places, he did accompany him to the places. Although both their works were around the same themes, their perspectives differed vastly.